You don’t have to scour Pinterest to find free printables that you can use with your sticker paper. We’ve got several sticker paper printables that are completely free, fun, and useful! DIY has never been easier. Why Use Sticker Paper Printables? You don’t want to buy a bunch of individual packages of labels, gift tags, etc. Listen up parents and teachers—do you know what kids still like to see on their graded test or essay? A shiny A+ sticker! Even with all of the technology used by children now, seeing some encouragement on their papers goes a long way. 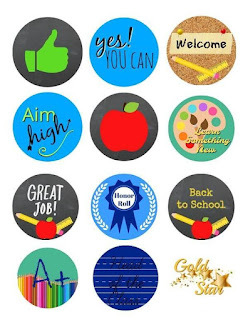 Simply print our downloadable school stickers (preferably using CompAndSave sticker paper) and then cut out the sticker shape. Voilà! Ready to reward little Jack or Emily for a job well done. Make your to-do list easy on yourself. We’ve got colored labels, meal plan stickers, and more for organizing tasks in your planner. No more searching through papers for your grocery list when there’s a colored sticker on top. Keeping track of your water intake has never looked this good. You won’t miss that daily reminder to drink up when you use our water count stickers. All you have to do is stick the reminders at various points on your water bottle, starting with “Filled” and ending with “Refill.” Before you know it, you’ll have downed that 32-ounce water bottle. Only one more bottle to go to reach the recommended 64 ounces! Yes, the holiday season is over (bah humbug). But keep these cute printables in mind for Christmas later this year. We have stickers and gift tags to adorn your presents and cards. You’ll be feeling cheery in no time as you wrap gifts and make holiday crafts. What sticker paper printables would you like us to offer next? Let us know in the comments below. Don’t forget to download your free printables!